IRVING, TEXAS, June 7, 2016 - (ACN Newswire) - YPO, the world's leading network of global chief executives and business leaders, announced the three winners of the Thomas Alva Edison Innovation Awards recognizing world-class innovators that have developed pioneering, breakthrough business solutions. 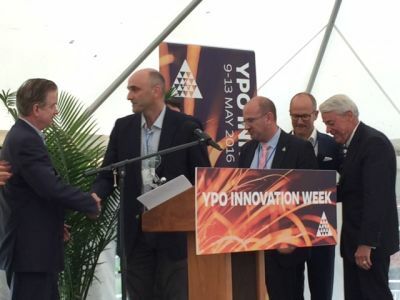 The awards were introduced as a part of the inaugural YPO Innovation Week, a series of more than 50 events around the world focusing on the latest trends in innovation. "The spirit of innovation fules YPO member companies," said Kevin Fallon, CEO of Pivotal Innovations Inc. and chair of YPO Innovation Week. "As Edison demonstrated, innovation is all about bringing a better future to the world now. Opening up these awards to our members brought innovation to the forefront of everyone's mind." The awards, voted by members of YPO, were presented at the home of the 20th century's innovation lab, the Thomas Edison National Historical Park. YPO member Michael Lewis, founder of RealD, was announced as the overall YPO winner of the Thomas Alva Edison Innovation Award. This award celebrates an individual who embodies the Edison philosophy of iterative experimentation and learning to inspire the development of new products and services. Fueled by his passion for movies and technology, Lewis founded RealD to perfect the visual experience on every screen and device around the world. The road to success was paved with multiple experiments using existing technology, expanding its capability and perfecting the result. From its initial launch in 2005 in 100 theatres showing one Disney film, RealD has grown to be utilized in more than 28,000 theatres in 72 countries. RealD is used in other applications outside of cinema, including laptops, tablets, mobile devices and automotives. Des Watkins, CEO of Watkins Steel in Brisbane, Australia, received the Tommy Award in the "Out of the Box Innovation" category. This award recognizes a leader who overcame severe limitations in capital, materials and resources to develop an unusual solution to a challenge - stepping out of conventional thinking to achieve a viable solution. Established in 1968 as a family business, Watkins Steel has grown from its humble beginnings to become a thriving force in the industry. By successfully integrating this 3D technological software (originally developed for surveyors), Watkins Steel created a completely unique end-to-end digital workflow for steel fabrication and installation. Of the company's recent innovation award, Watkins said, "We have won this award because we have been able to leverage an understanding of our customer's pain points to create this entirely digital process. I'm passionate about constant innovation, and when you are onto a winning thing you can't stop there." James Peters, CEO of ShowerPot(TM), received the second Tommy Award, under the "Playfully Inspired Creativity" category. This award celebrates a leader who embodied Edison's use of team-based creativity, playful development techniques and humor to inspire the development of new products and services. Peters is an inventor, designer and patent holder of the highly effective, functional artwork, the ShowerPot(TM), that captures wasted water and "teaches North Americans to rethink what we do with our precious and diminishing drinking water." "ShowerPot(TM) can replace the 50 billion bottles of water consumed each year in North America in just 12 days. Only 23 percent of these bottles actually make it to recycling with the balance continuing to pollute our oceans and landfill," said Peters. "ShowerPot(TM) is a functional piece of art that has been crafted after years of combining ancient technology with state-of-the-art, computer technology." Following the Thomas Edison award ceremony, the award winners and other YPO members participated in the closing bell at the Nasdaq MarketSite in Times Square. Sir Richard Branson joined via live broadcast, as the final keynote speaker, to celebrate the successful conclusion of YPO Innovation Week.